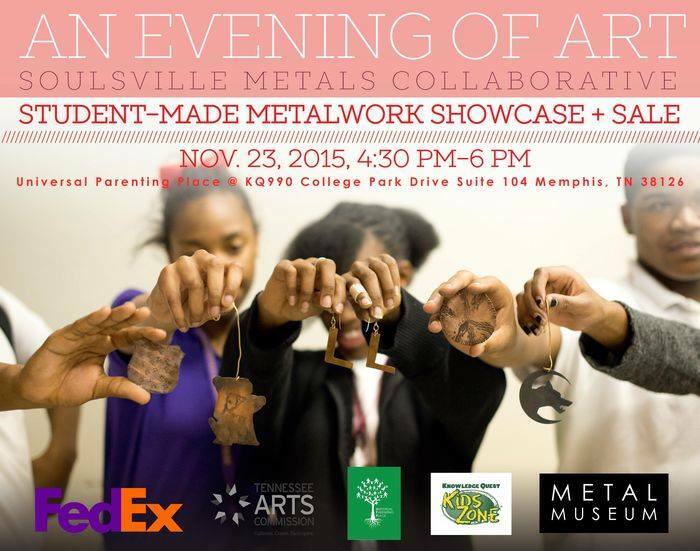 "An Evening of Art: Soulsville Metals Collaborative"
This semester, students met twice a week to create ornaments for the holidays. They spent the first six weeks of the semester getting certified in sawing, filing, and stamping copper sheet metal. Metal Museum educators Darcie Beeman-Black and Lori Gipson presented the students certifications in enameling at the gathering last night. Knowledge Quest and the Metal Museum hosted the gallery opening to give the students an opportunity to share their handmade artwork to both Knowledge Quest members and Metal Museum patrons. The students also demonstrated the techniques used to create fine metal work at a jewelry workbench set up in the gallery. The proceeds from the sales of student work go back into materials and tools for the program. For those of you that missed the opening, student work will continue to be for sale at the Metal Museum Store.